That’s a stance Verb has in common with Idris Goodwin, the gifted dramatist who wrote “Hype Man,’’ and also, crucially, with Company One Theatre and its artistic director, Shawn LaCount, who is helming the outstanding world-premiere production of Goodwin’s new play-with-music. “Hype Man’’ has things to say and it says them, emphatically, without shortchanging the imperatives of storytelling and characterization. Company One’s production sizzles with the kind of dynamism that can result — if we’re lucky — when a playwright with a distinctive voice and an urgent message teams up with a theater troupe whose aesthetic and sense of mission are as sharply defined as his. Bennett is ably complemented by superlative work from Michael Knowlton as a white rapper named Pinnacle, the leader of their trio, who bitterly opposes Verb’s social activism on the grounds it could harm their commercial prospects just as they are preparing for an appearance on “The Tonight Show’’; and from Rachel Cognata as Peep One, a beat maker of mixed race who is the newcomer to the group. Under LaCount’s boldly assured direction, the cast meshes together beautifully. The ties that bind their characters and the fissures that open between them are made equally palpable onstage at the Plaza Theatre, and the trio also teams up for some scorching musical performances. (The verstatile Bennett also shouldered the duties of music director and beat maker.) “Hype Man’’ unfolds on a set, designed by Lawrence Moten, that features irregular gray columns affixed to a blue wall, like fluctuating sound waves. 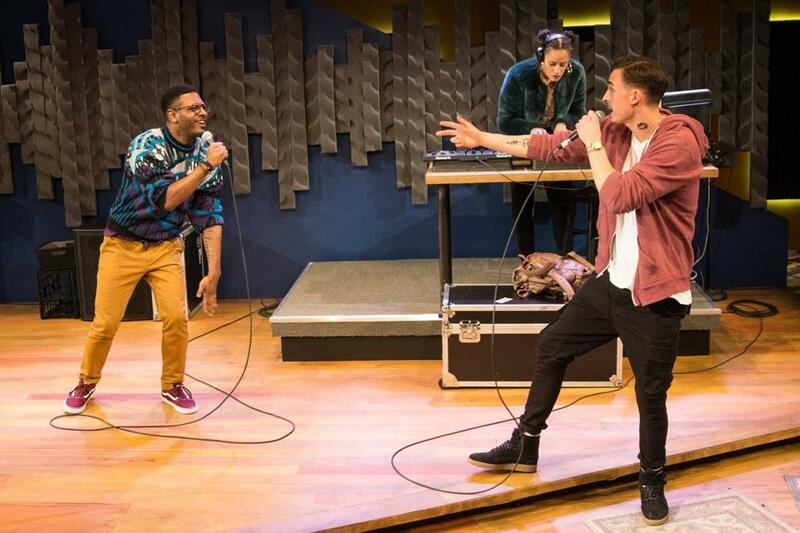 Two years ago, Lowell’s Merrimack Repertory Theatre staged Goodwin’s less successful “The Realness: a break beat play,’’ set in the mid-1990s, about a male college student who becomes smitten with a female rapper. “Hype Man’’ finds Goodwin again exploring the hip-hop milieu, but this time very much in the present day, blending a torn-from-the-headlines, Black Lives Matter immediacy with the razor-sharp characterizations that have been among his consistent strengths. In “Hype Man’’ Goodwin makes perhaps his strongest case yet for hip-hop culture as a crucible where issues of racial identity, gender inequity, career ambition, and friendship converge and collide in illuminating ways. Bennett and Knowlton are thoroughly convincing as longtime friends who are now fiercely clashing, their bond coming apart at the seams, although Pinnacle’s reaction to the shooting seems a bit too obtuse. (“I’m not political like that,’’ he says after Verb seizes an opportunity to stage a very high-profile protest of the teenager’s death. “That’s not my brand.’’). The complicated history shared by Verb and Pinnacle includes a racially fraught episode from the summer after they graduated high school that, tellingly, was marked by a key detail that the latter doesn’t appear to remember — but the former will never forget.